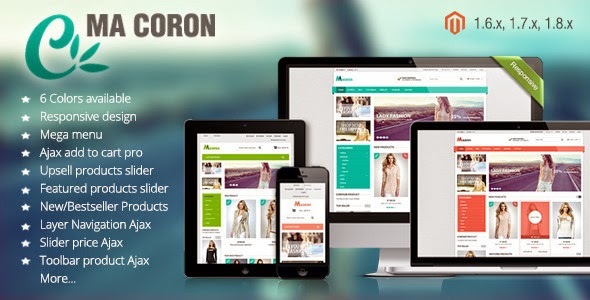 Coron is a fashion Magento Theme from Plazathemes. It offers full features, advantages of Mageto and our extensions, such as: mega-menu with many multiple columns styles, constantly updating new products, featured products, best-seller, …Coron Magento Template perfect fit with fashion, clothing, apparel products. Coron has 6 colors : teal, blue, green, brown, orange, red. You can option any colors in 6 those colors to show in your store. All categories are sorted in Vertical Menu displaying information impressively. New products, featured products in new products slider, featured products slider displaying buttons and images products beautifully and sophisticatedly. Static blocks in left column with nice images and helpful information make this template more vivid. Customers can purchase products very conveniently and fast by layered navigation ajax, ajax cart super extension. So many more extensions are waiting for you to explore. Item Reviewed: Coron - Fashion Responsive Magento Theme 9 out of 10 based on 10 ratings. 9 user reviews.